Allied Healthcare Group is the stock chosen for chart analysis this week-end, as one of the stocks in my share-portfolio. It came to my attention a few weeks ago as a minnow biotech stock with potential to transform over the next few years into a significant player in the Healthcare Sector. Tissue engineering technology using the patented ADAPT process on bovine, porcine and kangaroo tissues (pericardium) to produce a product CardioCel for implantation in cardiac surgery. A R&D division, Coridon, to develop revolutionary new vaccines to boost cell mediated immunity against the Human Papilloma Virus (HPV) and the Herpes Simplex Virus (HSV). This work is being undertaken by Professor Ian Frazer, the developer of the Gardasil vaccine to prevent cervical cancer. 28/01/13 – $4.6m SPP capital raising completed to launch CardioCel. New shares issued at 2c/share. 04/02/13 – $200,000 invested in Coridon. Equity position is 46.8% ownership. 13/02/13 – Initial step achieved towards obtaining CE Mark approval to market CardioCel in Europe, with ISO 13485 certification. The Net Tangible Asset Backing for the shares declined from 87 to 81 c/s due to share dilution from the swap merger of the two companies, not decline in the assets. In Australia via the Authorised Prescriber Scheme. Further positive results anticipated in pre-clinical trials of the DNA vaccine against Human Papilloma Virus (HPV) for cervical cancer. 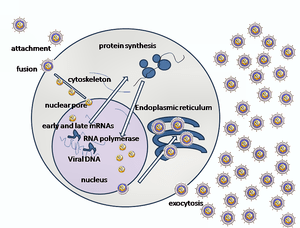 2H 2013 is targeted for Phase 1 study of the DNA vaccine for Herpes simplex Virus 2 in a project with the University of Washington. Professor Ian Frazer has also been associated with a project to develop a DNA vaccine against the Epstein Barr Virus together with the University of Ohio. In a trading range since August 2012 between 21 and 26 cents. Technical analysis is less reliable than usual as a predictive tool on speculative shares. The catalyst for price movement in this sector is the flow of news about the company. However since there has been an extended decline in the share price as noted above, the Fibonacci retracement levels can be used as targets to follow price recovery in the coming months. 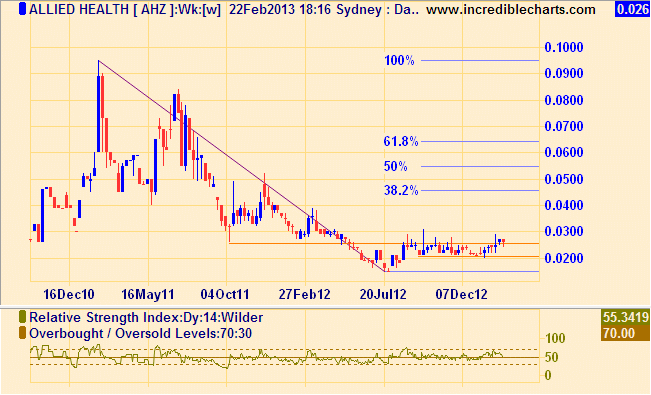 The 38.2% retracement level following a break-out is $0.0456. The 50% retracement level is at $0.055. With the share-price wavering at only 2.6c/s, this year could well prove to be a make or break year for the company. This post is to provide background information only about this stock, and should not be relied on in making investment decisions. See Disclaimer above. Prana Biotechnology trials new drug for Dementia sufferers. Did you create this website yourself? Please reply back as I’m looking to create my own personal site and want to find out where you got this from or exactly what the theme is called. Thank you!